Dan Ariely’s Predictably Irrational totally blew my mind. 'While I was thinking of the best books to add to this short list, I realized that not even half of them are directly related to digital marketing. This is because I believe that the best marketers are people who understand human nature deeply and aim to bring out the best in it. Call me naive, but that’s how I see it. If I were to want to pursue a career in marketing, I’d read [...] Predictably Irrational. Some other books I’ve really enjoyed: [...] Predicatbly Irrational. I work in digital marketing so I would [recommend]: Predictably Irrational by Dan Ariely [...]. The title does an amazing job of summing up the entire book. Think you make rational decisions based on logic and reason? Think again! A complete eye-opener that everyone should read. Predictably Irrational from Dan Ariely is also an excellent, insightful read. The example for pricing subscriptions for the economist is something every entrepreneur needs to be aware of and look to always apply. I am a believer in gestalt. By reading so many books in so many different genres it helps me get analogies across categories to get a better understanding of how things work. In terms of specifics, I use behavioral economic tricks as presented in books like Predictably Irrational by Dan Ariely in product design, negotiations and presentations. A phenomenal work from Dan Ariely on why we make seemingly irrational choices. “Incognito: The Secret Lives of the Brain” and “Predictably Irrational” are 2 very good books on psychology that I think you should read. 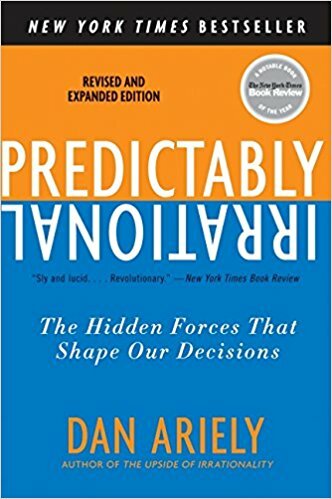 In the book, Prof. Ariely shows, through a series of experiments, how irrational human decision making really is - but there is order to the madness. Very important read for any engineer/logical thinker who's frustrated with how rash, emotionally driven and seemingly random many decisions seem to be. The book shows that often there is a pattern even if it "doesn't make sense".